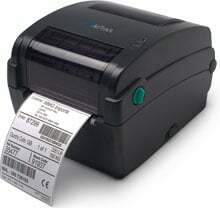 The DP-1 is a desktop thermal barcode printer that offers a high performance in a small package. Its extensive suite of barcode labeling features includes faster speed and multiple interfaces, making it an ideal printer for compliance labeling, asset tracking, shipping, receiving and inventory control applications. I bought this printer for my shipping department. It was easy to set up and prints fast and crisp. USB Interface Cable, 5 ft. Serial Interface Cable, 6 ft. Parallel Interface Cable, 6 ft.
4" x 1" Thermal transfer paper label. 2,260 labels/roll, single roll. Also available as a case (Part# 83340-COMPATIBLE). 4" x 1" Thermal transfer paper label. 2260 labels/roll, 4 roll case. 2" x 1" Thermal transfer paper label. 2,260 labels/roll, single roll. Also available as a case (Part# 83259-COMPATIBLE).